This is my first wm, so I would very appreciate any comments, ideas, collaboration, etc. interesting and quite powerful. 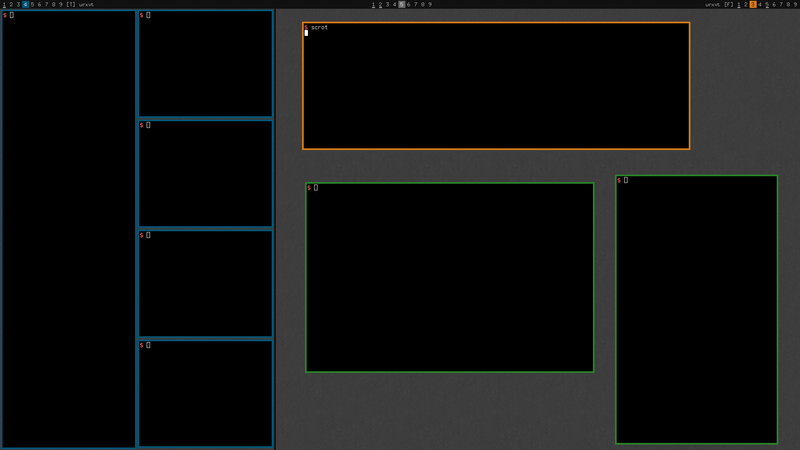 I like the colors, drag drop between screens, and all the view options. Is there a way to change automatic tiling mode to vertical stack or grid? There is only one tiling mode right now, but I is not hard to code other tiling modes. I implemented only one for the testing but I'll try to implement vertical stack and grid tomorrow. thanks for quick reply. Also one thing I miss from dwm is the time/date showing in the bar. Is that difficult to implement? and recompile, then there will be space for external bar which can be used for whatever you want (like clock, etc.). I know it would be better to have that kind of a functionality in main bar, but there is a problem because now there are tags in the left, middle & right so there is not a good place where to place clock. There are many indicators in that top bar so I've made EXTERNAL_BAR_POSITION for someone who want to use some system indicators, like clock. I wonder if this can be done on a lower level; independent of the window manager. Some Xinerama hackery perhaps? Yes, dual monitor setup is a problem right now, but I'm planning to add dual monitor support in the future. I have widescreen monitor with 1080p and that was the primary reason for this project. You are right about smaller screens, splitwm is not ideal for them, but you can disable "views" functionality with Mod1+v or Mod4+v so you can work like with "standard" wm. I'm not really any Xinerama expert so I don't know, but It would be interesting to find out if it can be done. You could replace libxinerama with fake xinerama and define all virtual screens manually. If you want to keep the automatic features, you'll have to craete your own patch. That is interesting, Thank you. I've added grid tile support as netfun81 requested. Also updated a little bit bar tags. I've uploaded AUR package for those who don't want to mess with the github. Still, feel free to e-mail/message me for any request or idea.